Clients can choose an account that suits their skills and experience in trading. Beginners may want to start with the Master trading account with the minimum deposit of $10. Trading is performed in microlots securing a client against huge losses. More experienced traders, who would like to maximize their returns, will benefit from the Expert trading account with the minimum deposit of $10,000 and spreads starting from 0.9 pips. Those traders who make a $100,000 deposit become VIP clients and enjoy better trading conditions such as narrower spreads starting from 0.7 pips. Clients of NPBFX are allowed to use expert advisors, scalping strategies, and algorithmic trading. Traders have an opportunity to receive a reward for attracting new clients. The amount of the reward can vary between $1 and $4 per one lot from each deal depending on the referral’s account type. I've signed up for a demo account and now also a real account with $380. So far NPBFX showed the best results, I trade the Gold , and they have decent spreads and execution on the indices on their MT4 platform, spreads are the lowest among the brokers I have ever seen. This week I made $260 withdrawal again which is the 3rd through, as usually arrived in my webmoney account in 6 hours. Overall my trading life is very much comfortable now. It has only been a few months and I can already see myself staying at NPBFX for a long time. All I ever received from this broker is just pure excellent services. From the educational aspect, to the platform, spread, customer support, and transactions. I deposit through wire and it is reflected in just a few minutes. I also withdrew once through wire with an amount of $300 and it was transferred on the same day. So far, with my experience, all I can say is that this broker gives the best to their clients. NPBFX is reliable broker and I think all of my friends and falimy should trading here and they will get big profit like me. It is a great broker, I joined them 3 yeras ago and until now I got money out with no problem whatsoever. The stop loss limit and take profit are working fine and nice minimum lot size at only 0.01 lot. I enjoy the size of the micro lot and the spread which is low and stable during volatility time. I trade with them on MetaTrader 4 platform, using the currency pairs EUR/USD and GBP/USD but I didn't had problems with them. I am truly satisfied and wanna make deposit again and over again. I have been using NPBFX for 2 months and I am very satisfied with them. I found that their spreads are the lowest I've seen anywhere and their execution is almost instant. I´m trading with an EA and trades are opened and closed without problems. My profit is 370$ just in two months. I also a withdrawal of 200$ from my profit and they processed it within same day. I do not any reason to leave this broker. Regulated and reliable broker, I opened an account with this broker as a beginner. I started with the Master trading account with a deposit of $10. Trading is performed in micro lots securing me against huge losses. Everything is okay. I started on live trading account this month and I have got my first withdrawal in my account. Even if I asked a question by chatting, I gave it a try and I was asked again for a phrase that was waited for 50 minutes. Support is not working at all. Initially I was searching too many forex broker to ensure that I am getting the right one. 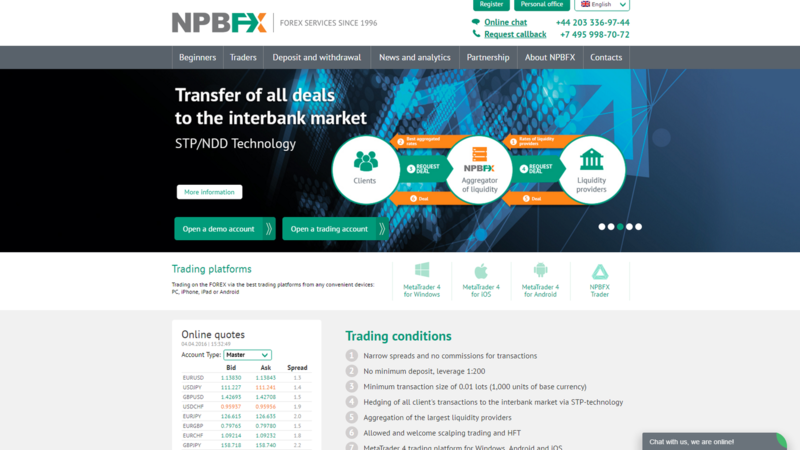 After 1 month searching, I have found NPBFX website with very clear information. To be real, as a new comer I would like to feel comfortable with the broker I choose. MT4 trading platform working properly and currently I am working with a Micro lot account to protect myself from huge losses. Initial fund allowed as low as $10. At this moment, I am generating quite a stable profit about $50 per week. In fact, I am choosing the right pair both EUR/USD and GBP/USD. The spread relatively average at 0.7 point for major pair. I am in the midst of calculating my profit and soon to withdraw it by Skrill method. Not complicated while approval less than 3 days. I wish more profitable trades with you guys! I have been having a good experience trading with NPBFX , good trading services, and everything runs fast and smooth. The servers they manage for the trading platform work well, so there isn't delay in the execution of trades and they even allow all type of strategies and the use of EAs. I trade fx currencies especially the ones like EUR/USD, USD/JPY and the rebate is high so I won almost 45% from my deposit as the profit and they also gives me bonus.The withdraw process through wire transfer also run fast without any problem. Very nice and I'm happy. And now I have spend 2 years with this broker and I have been able to make some significant profits on their platform. Very profitable broker. You guys must try. I am trading with this broker since 2015 and although I started with a deposit of $15, just after 6 months, I got to accumulate $600. For me, it was great! With that money, I could pay my bills and other expenses. I invested again $100 more and thanks to fixed spreads, it is easy to get more money. Also, I watch carefully all the news they post in their website because they are accurate, as well as analysis. They help me a lot to forecast the next moves of the market. Skrill is the best way to deposit and withdrawal as both of them just take a few hours and with low commissions. I am making thousands of money in NPBFX since my first trading in 2012 until now. I remember when the first time all the registration process done very easy, all document is verified without any problems. I like all the things in this broker because it is efficient, I can do hedging or scalping without problems and their level of security of trading is very satisfactory. In every monthly trading I earn profit about 45% to 70% from my deposit. The the spreads are okay and the minimum account size is normal. I can assure that this company is an honest and reliable broker and their servers are amazingly okay. Very interesting broker.